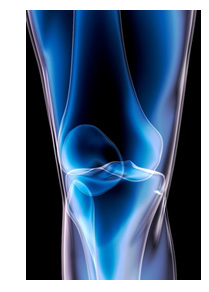 What is Joint Fluid Therapy? 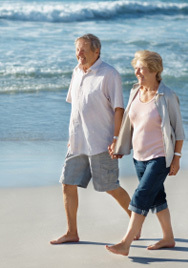 Is Joint Fluid Therapy Right for You? Join Dr. Ginsberg at one of his free seminars where he discusses knee and joint pain and how The Center for Joint Therapy can help. If you suffer from knee pain, you are not alone. About 1 in four people over the age of 55 complain of knee pain. Osteoarthritis (OA) currently affects more than 27 million Americans and is a leading cause of disability. At the Center for Joint Therapy, we treat knee pain due to osteoarthritis (OA) with viscosupplementation (joint fluid therapy). Viscosupplementation has been used to restore the lubricating and shock absorbing qualities of the synovial fluid to the knee. Our treatment plan combines Supartz (sodium hyaluronate) injections with a physical therapy program that is focused on enhancing the strength and flexibility of the knee. All of the injections are personally performed by Dr. Ginsberg using fluoroscopy (live-motion x-ray) to ensure maximum accuracy and minimal to no pain. For the past 7 years Dr. Ginsberg has treated hundreds of patients and performed more than 10,000 injections in patients with osteoarthritis. Viscosupplementation was first approved in the United States by the FDA in 1997. Supartz is the number one viscosupplement used world-wide and more than 170 MILLION doses have been administered. For your convenience the physical therapy portion of the program takes place here at Gateway Regional Medical Center. 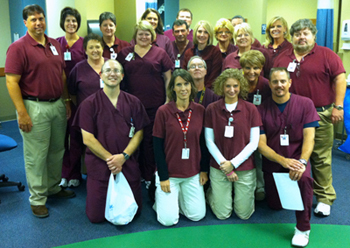 We are staffed with 6 full time physical therapists and 5 physical therapy assistants with 15 years average experience. Emphasis is placed on one-on-one individualized patient care tailored to each patient's needs. Treatment plans are specifically designed for each individual to reduce pain, improve function and quality of life. If conservative treatment has not helped, or you simply want to delay a knee replacement, or are not a candidate for surgery please call us today at 618-798-3350. It is certainly worth a shot!